Ballynahinch lost their first game at home this season in a thrilling cup-tie against north Dublin side Clontarf on Saturday evening. Playing in perfect conditions both sides served up a most entertaining game with the result in doubt right up to the final whistle. Hinch played towards the clubhouse in the first half, and opened the scoring in the 10th minute when Ross Adair intercepted in the ‘Tarf half to dot down near the left corner, Richard Reaney converting to give the home side a 7-point lead. The Dubliners were back on level terms in the 16th minute when second row Tom Byrne smashed his way over from close range with David Joyce adding the extras you make it 7-7. A great break in the 27th minute by Adair should have resulted in a second Hinch try but his final pass to Paul Pritchard was not accurate and the chance was missed. Reaney put the Hinch 10-7 in front with a penalty goal in the 31st minute after they Leinster men went offside at a ruck. ‘Tarf hit back with a second try from Tom Byrne in the 39th minute after the visitors took play through a number of phases which eventually ended with an overlap out right where Byrne dived in to score an unconverted try to leave his side with a narrow 10-12 lead at halftime. Hinch made a poor start to the second half gifting a penalty attempt for Joyce in the first minute, which he pushed to the right of the posts. 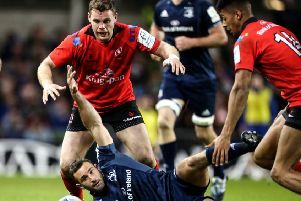 “Tarf increased their advantage in the 45th minute with their third try which came after another period of sustained pressure where play was taken through a number of phases. Eventually the ball was moved left to send wing Rob McGrath clear to dive in at the corner. Joyce failed to convert leaving his side 10-17 clear. Reaney closed the gap to 13-17 with a well-struck penalty goal in the 50th minute. Play remained nip and tuck for the next ten minutes with the Hinch starting to take control. In the 64th minute a good run from Charlie Butterworth created room for Stephen McCauley to attack down the right wing. The Hinch man did well to stay strong and skip past a number of tackles for a well-taken score. Reaney added the extras to take the home side into a 20-17 lead. As the game entered the final stages the Dubliners threw everything into attack and in a carbon copy of their previous try right wing Michael Brown came into the line and went over in the left hand corner. Joyce did well to convert from the touchline to take his side 20-24 clear with four minutes to play. Hinch threw everything at the ‘Tarf defence and play never left the visitors 22 for the remainder of the game. Time and time again the Hinch had a drive for the line and then with the final play it looked like an overlap had developed out wide but Michael Graham was tackled into touch by Joyce to conclude the match and secure a place for Clontarf in the Bateman Cup Final. Ballynahinch and Clontarf will meet again at Ballymacarn Park in 3 weeks time for the final Ulster Bank league game of the season. With both teams still pressing for a play-off place it is sure to be a game not to miss.